We all say or do things that make our dads angry or sad (except Jaden Smith), but everything can be mended with a simple apology and maybe a nice gift. And if your dad likes tasting exclusive and rare Spirits, we have some good news for you. It all started with one man. This is a really interesting idea. Take pure well water and sit it in a smoke house for five days. Then use this naturally-scented water to make an award-winning Vodka. Boom… just like that, you get Chase English Oak Smoked Vodka. This is the PERFECT way to bring a savory smokiness—like you get from charred barrels or by drying your barley-malt over a peat fire. That’s it! Think of Chase English Oak Smoked Vodka as the kind of Vodka they would make on Islay in Scotland … if they made Vodka on Islay. What you end up with is a pure, yet smoky flavor that is hard to define, but easy to enjoy. And make no mistake, this is seriously good, premium potato Vodka made in exceptionally small, 1000-bottle batches. But think about this for a minute and let your crafty-cocktail mind expand with the possibilities. Just imagine what it would do to a classic Bloody Mary or Dirty Martini? It’s all about the smoke! 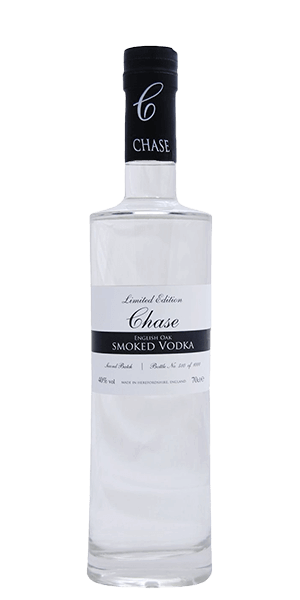 What does Chase English Oak Smoked Vodka taste like? The Flavor Spiral™ shows the most common flavors that you'll taste in Chase English Oak Smoked Vodka and gives you a chance to have a taste of it before actually tasting it. Super flavorful- really solid to drink straight! Wow. Blown away by this vodka. Totally different than anything I have previously experienced. This much Smokey flavor in vodka is great and I could drink this straight everyday. Really enjoy this as a mixer in vodka drinks to makes smoked versions. I.e. Wife & I love doing 2 OZ of this vodka with .5 to .75 oz of Chase Elderflower Vodka/Liqueur & Ginger Beer of choice to make Smoked-Elderflower Moscow Mules. Surprisingly smoky; delicious. Would make an interesting martini, even though gin is our go-to. Best vodka experience. I don't like vodka. I love this. I didn't even mix it. It was excellent on the rocks! Not bad. Had a surprising kick after swallowing it. I'd purchase more later to share with others. Only vodka that I enjoy. Smoke is pleasantly overwhelming with a dry, smooth finish. Tastes like a perfect summer day at the west coast of Sweden. Fresh nose with a smokiness that reminds me a lot about smoked mackerel with fresh summer potatoes. The after taste ends in a very gentle way. I will definitely look for this in stores. God why can't I get this in the US. Perfect for straight dipping with a single ice cube but would probably make an awesome Bloody Mary or Bloody Caesar. Amazing flavor. Strong smokiness, but not over powering. Would definitely have again. It's like a potato skin with bacon. In a bottle. And my belly. Too smoky for martinis but a wonderful aperitif.